Apple has released MacOS Mojave developer beta 10 to Mac users enrolled in the Mojave beta testing program. Typically the developer beta build rolls out first, soon followed by the same release being issued as a public beta, though usually versioned as a release behind (i.e. macOS Mojave developer beta 10 and macOS Mojave public beta 9). Mac users currently running a beta version of macOS Mojave can find the latest software update available now from the Software Update control panel within System Preferences. If the update is not yet showing as available, sometimes quitting out of System Preferences and relaunching the Software Update control panel can make it appear, otherwise simply waiting a while can work too as the update rolls out. 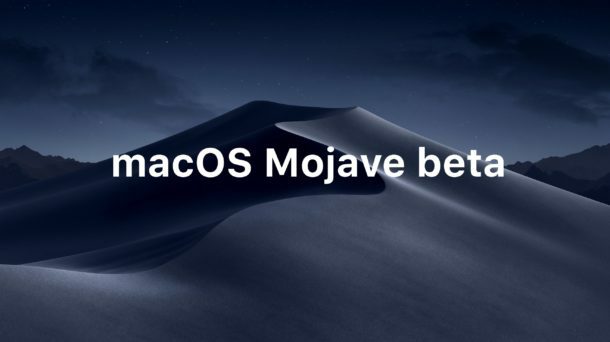 Anyone can run macOS Mojave public beta on a macOS Mojave compatible Mac, though running beta system software is generally only recommended for advanced computer users. Another more forgiving option (which does not impact the primary stable MacOS installation on a computer) is to run macOS Mojave in a virtual machine with Parallels Lite, which is a fairly simple process and uses the free version of the Parallels virtual machine software. MacOS Mojave includes a variety of new features for MacOS, including an all new Dark Theme, desktop Stacks which can help tidy up a messy desktop full of files, a new optional preview panel in Finder windows, the inclusion of various iOS apps on the Mac including Voice Memos and Stocks amongst others, and a variety of other various enhancements and improvements to the Mac operating system. Last week Apple released iOS 12 beta 12 for iPhone and iPad beta testers, along with updates to the beta versions of watchOS and tvOS for Apple Watch and Apple TV beta testers. Apple has scheduled an event for September 12, where the final release dates of iOS 12 and macOS Mojave are expected to be announced, alongside updated iPhone and Apple Watch hardware. Previously, Apple has said that macOS Mojave will be released in the fall of 2018.